Halloween 2006 remains an infamous day for many income investors. That’s when Finance Minister Jim Flaherty pronounced that starting in 2011, Canada’s wildly popular income trusts would be taxed as corporations starting. Shareholders took the news hard. By mid-November 2006, income trusts had collectively lost roughly $24 billion in market value. Then a funny thing happened. Investors started treating income trusts as they would companies organized as taxable corporations—not exotic vehicles to limit their tax obligations. Trusts with healthy, growing businesses began to gain value; those whose operations floundered lost ground. By Jan. 1, 2011, many trusts had already converted to taxpaying corporations. But as the rest followed suit, it became clear that dividends remained a priority for these former trusts. In fact, the big surprise of the conversion process was just how little dividends changed—and how quickly the best ex-trusts started growing their payouts. The 18 former Canadian income trusts in our table have generated an average total return of 245.3 percent since Flaherty ended their favorable tax status. That’s better than three times the gain posted by the S&P 500 over the same period. Not every former trust has thrived. Once Canada’s largest mid-major oil and gas producer, Penn West Petroleum (TSX: PWT, NYSE: PWE) has struggled mightily in the post-trust era. The company’s latest debacle involves an accounting review that uncovered hundreds of millions of dollars in misallocated expenses and forced management to pull several years of financial statements. These challenges contrast with the steady results and huge production growth posted by light-oil producer Crescent Point Energy Corp (TSX: CPG, NYSE: CPG). Whereas Penn West Petroleum’s hydrocarbon output has shrunk to less than 107,000 barrels of oil equivalent per day (boepd) from almost 130,000 boepd in 2006, Crescent Point Energy has grown its production to 140,000 boepd from 21,000 boepd. Even when you factor in dividends, Penn West Petroleum’s stock has given up more than half its value since Halloween 2006; shares of Crescent Point Energy, on the other hand, have gained more than 360 percent. Good businesses always rise to the top, regardless of their structure. The outperforming former trusts in our table have continued to execute operationally and pursue smart strategies to grow their underlying businesses. Midstream operator Keyera Corp (TSX: KEY, OTC: KEYUF) may lack the popular appeal of US master limited partnerships (MLP), but its stock has generated a total return of 819 percent since Halloween 2006—more than twice the gain posted by Enterprise Products Partners LP (NYSE: EPD). The Canadian company has also raised its dividend by 82.5 percent over the same period; by comparison, Enterprise Products Partners has grown its distribution by 56.5 percent. Fuel distributor and marketer Parkland Fuel Corp (TSX: PKI, OTC: PKIUF) announced a blockbuster deal this week, buying Suncor Energy’s (TSX: SU, NYSE: SU) Pioneer Energy unit for CA$378 million in cash and common stock. Pioneer Energy controls 12 percent of Ontario and Manitoba’s retail gasoline markets. After the transaction closes, Parkland Fuel’s share of Canada’s fragmented fuel distribution market will increase to 9 percent. The deal will also be immediately accretive to cash flow. With Parkland Fuel slated to complete its margin-enhancing “Penny Plan” in 2015, this acquisition should enable the firm to generate CA$250 million in cash flow next year—more than four times the amount that the firm produced in 2006. Although the fuel distributor slashed its dividend by 19 percent when it converted to a corporation in 2011, the firm has hiked its payout by more than 40 percent since Halloween 2006. These success stories contrast sharply with the sad case of Yellow Media (TSX: Y, OTC: YLWPF), the multimedia directory owner that effectively wiped out its shareholders by converting its crippling debt burden to equity. Revenue from the company’s print Yellow Pages business tumbled 22.5 percent from year-ago levels in the second quarter, dragging down the firm’s overall sales by 9.3 percent. Yellow Media’s underperformance has nothing to do with the firm’s conversion from an income trust to a corporation; rather, the company’s struggles reflect less-than-stellar management and the severe headwinds buffeting its legacy print business. For about a decade, I covered income trusts and other Canadian dividend-payers; investors who followed my lead and held these names after the so-called Halloween massacre generally have been rewarded with outsized gains. Of course, investors experienced plenty of volatility along the way. In fall 2008, for example, income trusts fell further and faster than the S&P 500, fueled by the collapse in the Canadian dollar to less than US$0.80 from almost US$1.10. But by and large, former income trusts have been solid investments since many pronounced them dead and buried after the government revoked their specialized tax advantages. In last week’s installment of Income Insights, I highlighted Canadian real estate investment trusts (REIT) for their high yields and undemanding valuations—often near or below book value. And the most recent issue of Capitalist Times Premium analyzed the merits of 13 Canadian REITs, including the two high yielders in my Lifelong Income Portfolio. Not a subscriber? Sign up for a risk-free trial of Capitalist Times Premium today; you’ll save $70 on an annual subscription and learn about my favorite Canadian REITs. 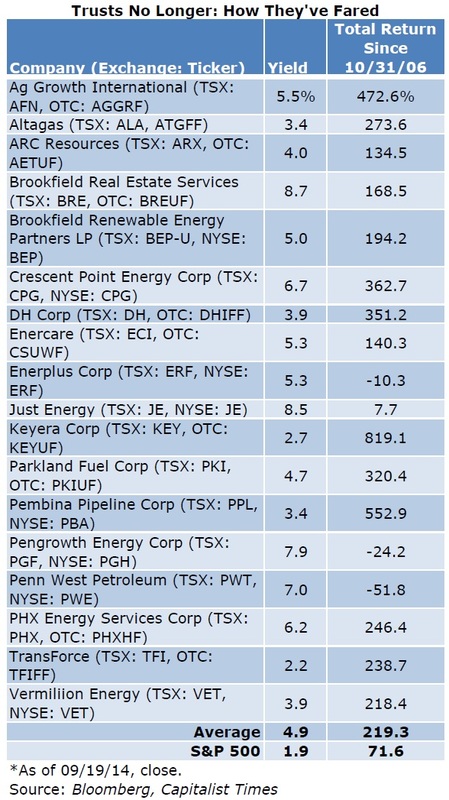 With the exceptions of Penn West Petroleum and Just Energy (TSX: JE, NYSE: JE), all the former trusts on our list have demonstrated their staying power. Among the 18 names in our table, Enerplus Corp (TSX: ERF, NYSE: ERF) and Pengrowth Energy Corp (TSX: PGF, NYSE: PGH) still trade at reasonable prices. However, we’d wait for a pullback to buy some of the high-flying names on our list. Big gains set a higher bar of expectations and leave room for disappointment. 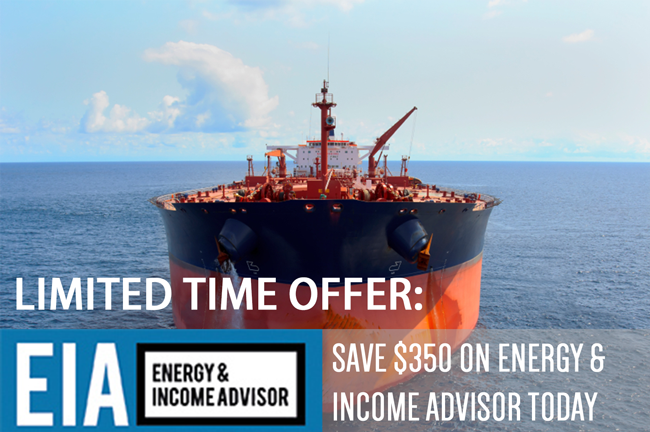 Investors looking for unparalleled coverage of these stocks should sign up for a risk-free trial of Energy & Income Advisor, where I cover almost 100 dividend-paying energy names from Canada and Australia. You’ll also receive instant access to my Conservative International Energy Portfolio, which has generated an average total return of 31.9 percent since mid-November 2013. The strong returns posted by the best former Canadian income trusts serve as an important reminder for investors who worry that the US government could take away the tax advantages enjoyed by master limited partnerships (MLP). We don’t expect the government to pull the rug out from under MLPs, especially when you consider the massive investments in energy infrastructure needed to support the shale oil and gas revolution. Nevertheless, in the event of such a calamity, MLPs that own high-quality assets would survive and continue to thrive; marginal names, on the other hand, would feel the pain. 09/02/14: Business News Network — Roger Conrad on Pembina Pipeline Corp’s recent acquisitions (video). 09/10/14: Money Life with Chuck Jaffe — Elliott Gue on stocks to hold and stocks to fold (audio). 09/10/14: MoneyMan Report — Elliott Gue on energy markets (audio). 09/11/14: The Energy Report — An Interview with Elliott Gue (text).